NHL News : Leafs ready to pawn Kapanen to the Oilers in trade deadline deal! Leafs ready to pawn Kapanen to the Oilers in trade deadline deal! The Leafs are reportedly willing to trade the breakout forward for the right return. The Toronto Maple Leafs' quest for a top-four defenseman to strengthen their chances of a playoff run is on and it is getting more and more serious. While it has been confirmed that the Leafs’ first-round pick this year is in play ahead of the trade deadline, TSN Hockey Insider Bob McKenzie revealed on Wednesday that one or even two forwards could be moved in return for the right addition on the back end. The Toronto fanbase will have to accept that general manager Kyle Dubas might ship out Kaspari Kapanen and Andreas Johnsson, who sit 22nd and 23rd respectively on the TSN's Trade Bait board. Both players are sett to become restricted free agents in July. “If you’re gonna get a good defenseman and they obviously want to get a good defenseman, you’ve got to give up something of value,” McKenzie explained during a segment of First Up on TSN Radio 1050 Toronto. “And not only would the first-round pick be in play, but I’ve been saying for quite some time now – take your pick, but one of Andreas Johnsson or Kasperi Kapanen will be gone too in the most likely scenario. It obviously depends on which defenseman they end up with and how much term is left, and what the guy’s age is, and what his value is, but it’s quite conceivable that both of those pieces could be departing for the right guy." Kapanen has impressed many at the start of the season when he filled in for William Nylander, who remained unsigned before the RFA deadline on December 1st. The 22-year-old forward sits fifth on the Maple Leafs with 15 goals and 28 points as he continues his breakout season. His appearance on the team’s first power-play unit only makes him shine more. 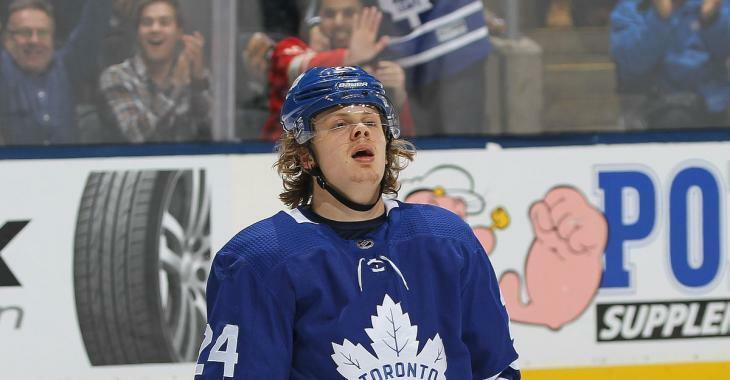 He could benefit from a change of scenery as if he remains in Toronto, Kapanen appears destined for a third-line role, behind Mitch Marner and Nylander, making somewhere around $2.5 million a season. Kapanen could be seen as more valuable than that, perhaps even at the $4-million level with the right team. The Toronto Star wonders if a deal could be done with the Edmonton Oilers if Kapanen is offered. The Leafs could also target Alex Pietrangelo of the St. Louis Blues or Brett Pesce of the Carolina Hurricanes. "Would the Edmonton Oilers bite? Kapanen’s speed and scoring ability would shine on Connor McDavid’s wing. And his ability to kill penalties and be a force in his own zone would be a match for coach Ken Hitchcock’s system. Could Kapanen for Adam Larsson ($4.167 million until 2021) be a potential deal? Larsson is 26." Johnsson isn't far behind his teammate, just seventh in scoring with 10 goals and 21 points this season. Rival teams might be interested to know that Dubas is willing to include his first-round play, but also one or two of his best players to upgrade the blue line.